Documentation?... Documentation. Let’s say for a second that you want to create a way to easily publish and read docs, err… documentation. By the end of this read you will be able to do just that, all with the power of Gatsby (a static site generator) and Cosmic JS (an easy to setup and use Content Management System). Grab some coffee, find a comfy chair and let’s build something cool. Gatsby is an easy to use framework for generating static web site files. It comes bundled with all sorts of hotness, like React JS for building web components, and GraphQL for handling our component state without the need to configure something Redux to handle external data. Cosmic JS will handle our publishing and data storage. It’s easy to set up and easy to implement for apps like this, yet scalable enough to handle more complex projects across larger teams. We will use this to create and store our documentation content. This will us allowing us to focus on how our users interact with our app, and let Cosmic JS do all the heavy lifting. Well no… we are going to convert our docs from markdown to html, since that’s what web Browsers like. To do this we are going to use a package called Showdown, that can handle parsing and converting markdown to and from HTML. Oh yeah, you will need to have access to a terminal, a Cosmic JS account with abucket and a documentation object, and a recent(ish) version of Node JS installed on your machine in order to install the necessary software to make this app work. I’m going to be using yarn to run my build scripts but you can npm if you like. Just remember to choose one(npm or yarn) and stick with it as things can get little hairy when it’s time to deploy. After a second you should see a success prompt letting you know that everything has compiled properly and your app is live. Whoa... That’s a lot of newly installed packages, but each of these are super useful I swear. cosmicjs will be used to add new content to our app. showdown is the text parser I mentioned that will handle markdown and html conversion. highlight.js is going to handle our syntax highlighting inside of our converted markdown text. node-sass and the gatsby-plugin-sass packages will allow to use .scss files to style our components. With all of that business out of the way we can look at our directory and configure our Gatsby source code to run properly. Now we can dig into our directory and make sure Gatsby is configured properly for using the technologies that will scalably and sensibly power our app. The first file we will want to look into is gatsby-config.js. This file is used to configure high level plugins that allow any source code we write to be bundled properly when our static files are built. It also contains a little bit of metadata that describes our site site to users and can be queried in our React Components. Here we will add our newly installed plugins to the default configuration you see before you. First we just need to add gatsby-plugin-sass to the plugins list, allowing us to import sass files and leverage sass to write sensible styling specs for each component. Now we are set to make GraphQL queries to the Cosmic JS GraphQL API! Next, Let’s talk for a second about Gatsby and how things are going to break down. 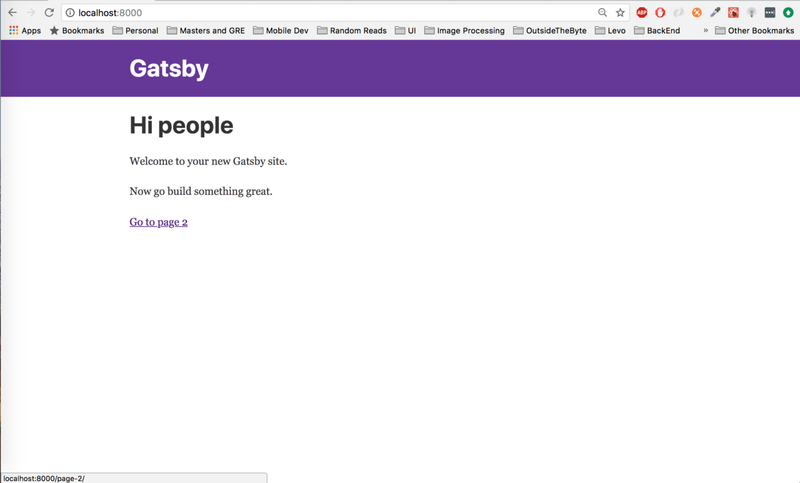 I’ve mentioned that Gatsby is a static site generator, but what does that mean? Gatsby takes all the fancy code we create and produces static files that are pre-configured using the config files we specify. By doing so we get increased performance for sites that may have lots of images, data to be fetched, and other assets that can slow down web applications. Let’s now get some source code created. Our site is going to use just two ‘Pages’, one that will serve a home page to list the documentation we've created, and one for viewing a piece of documentation. But to fetch the content that we are going to display, we are going to use GraphQL, which we have recently configured. We will need to add some variables to our gatsby-node.js file in order to allow our static files to have the necessary parameters to make API calls. In your Cosmic JS Bucket > Basic Settings menu you will see fields for a bucket-slug and read and write keys down at the bottom. Copy all three of these things and add them to a .env file. We will use these with our dotenv package to allow our src files to access these variables when necessary. Now we are going to create our first page that will grab all of the documentation objects and display them at the root of our site, on index.js. First let’s create our list by creating a folder in the components directory titled docs - /src/components/docs/ and in that folder we will create a file titled index.js. This page basically runs a big loop over our docs and returns some fancy jsx. We map through the docs array and produce a Link from Gatsby that contains the title, a date, and some content that uses a a description for the piece of documentation that was published. Feel free to add any .scss files to this directory as well to get a styling that works for you for the given class names. Now we can open up our home page file at /pages/index.js and import the components we just created and add them to our returned jsx. Now any docs created on Cosmic JS, will appear here on the home page! Notice the exported query at the bottom of the file. It contains two string type variable that will be present because we set the context object in our gatsby-node configuration. With our newly created home page working, let’s create our doc view that will display content from the documentation that we post. Instead of adding a new file to the pages directory in Gatsby, we are going to create a `templates` directory and make a template page that we can configure on build, so that each time a doc is created, a new page can be created when we fetch our Docs from Cosmic JS. Start by creating a `templates` directory at your project root, and then creating a docPage.js file within. Now add the page template complete with exported query that will fetch a singular doc from Cosmic JS. Nothing will happen with this template until we tell Gatsby that it needs to create a page using this template. We do this so that Gatsby has a chance to fetch our Documentation from Cosmic JS before it builds the page using the necessary parameters for each GraphQL query at the bottom of docPage.js. We are using static site files after all. Now when Gatsby creates its pages, ie - the index page will fetch our docs and create a page for each doc that is retrieved and attach all the necessary params to the page Content of each page. This way our template component is rendered and our GraphQL query should succeed! Lastly we can talk about deployment and about how static sites work. Deploying this bad boy can be a little tricky since this site uses a static build that won’t have the necessary pages of newly created docs until the deployment service has a chance to rebuild. My recommendation is to use netlify and link your source from GitHub or wherever you store your code. From there you can trigger buildhooks in order to rebuild your site whenever certain events happen. Cosmic JS will allow a post request to be fired off at an endpoint when objects are created, deleted, edited, etc. So you can easily link the two together to make some magic happen. You can also modify the addDoc method on the createDoc component class to make a POST request to the buildhook whenever you successfully add a doc. Anyway, that’s all for me folks! Happy hacking. In this tutorial I'm going to demonstrate how to build a photography portfolio website using React, Styled-Components and Cosmic JS. Let's get started. In this article I’m going demonstrate how to publish new Objects containing survey responses in Cosmic JS as they are completed in Typeform. Click here to connect Typeform to Cosmic JS using Zapier. In this tutorial I'm going to show you how to create a "Conference" app using a little bit of Node, and Cosmic JS. Filtering data is one of the most common feature of any data facing application, wheather it's a fron-end app or a back-end application. The Filter function is used to find records in a table or a dataset that meets certain criteria.